1. The cutter sensor cannot find the eyemark/target. Manually adjust the web so that the target is in the carrier window. 2. The print quality of the target may not be sufficient. Check for light or inconsistent printing on the target. 3. The media may be feeding crooked. Check for any frayed edges. Adjust guides accordingly. 4. The target may have been printed too close or too far away from the edge of the media. Measure the distance from the edge of target to the front plate of the cutter. Go to Advanced Tab – Advanced Offsets – Horizontal Target Offset. Set the value to the measurement you took. Typically, you will need to increase this value by 0.1 or 0.2 inches. Default is 2.25. To fix this for future prints be sure to verify the position of the target in PTPrint before printing. 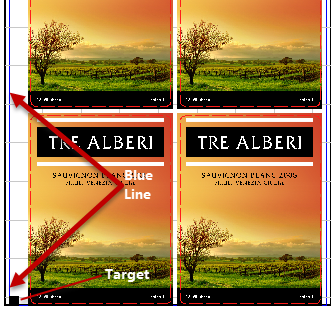 It should be just to the right of the blue page guides (Blue Line) in PTPrint. 5. Check for laminate that is partially covering the target. It should be completely covering the target or not covering it at all. Partial coverage can cause a difference in the reflectivity of the target to the sensor. This will cause an error. 6. Ensure all three pinch rollers are engaged across the width of the material. You should not be able to move them from side to side when locked. Disengaged pinch rollers will cause the media to advance too far forward causing the target to move past the sensor. In addition to engaging all pinch rollers they need to be free of all toner dust and adhesive. Use rubbing alcohol and a lint free cloth to clean the pinch rollers. Goo-Gone or Goof Off! can be used to clean any adhesive residue. 7. Clean the sensor area with canned air. Cutter dust may have built up in the senosr area.